• The formation of palpable and visible nodules, even in the tissue surrounding the defect, can be avoided if a fan-shaped implantation technique is used. • Fat necrosis occurs if too much fat has been implanted in a limited host area. Please note: the maximum distance permitted from the center of the fat droplet to the surrounding capillary tissue is 1.5 mm. Otherwise, fat necrosis and possibly calcification may occur. • Migration of the fat implant is possible if the injection is made into muscle or firm connective tissue. 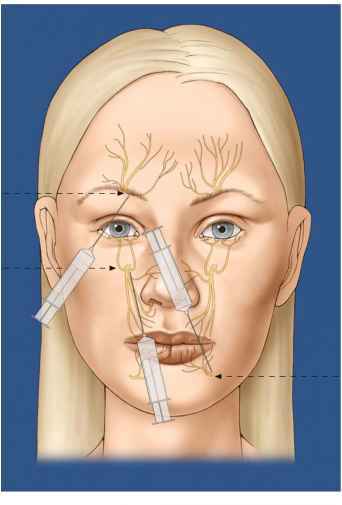 • Nerve and vascular damage is virtually ruled out if blunt cannulas are used. • The fat globules can be obtained easily using liposuction. • The transplant is autologous. • No immunological reactions/complications are to be expected. 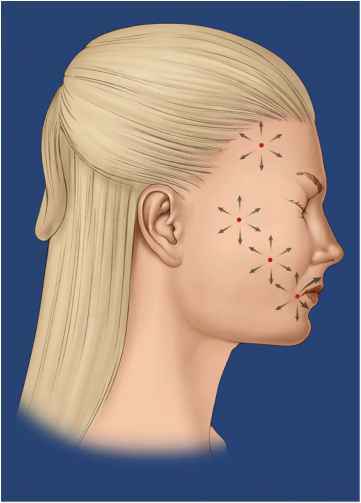 • Fat can be injected below all wrinkles and depressions if the correct technique is used. • It is possible to repeat the treatment without any problems. • The costs are comparatively low. Surplus aspirated fat can be frozen (e.g., 2x10 ml) and reinjected again in divided doses (at 0,6, and 12 months). The fat should be stored at -18 °C for no longer than 1 year. Remove the syringes filled with fat from the freezer 3 h before reinjection. Each fat transplant should be marked with the operation date and the patient's name and date of birth. As a result of the divided and repeated injection of fat cells, increased fibrosis (booster effect) occurs and this ensures a longer-lasting effect.